The cold front moving through the streets of Gotham City lately is the diabolical plan of Mr. Freeze, Poison Ivy and Bane plotting to put the Dynamic Duo on ice! 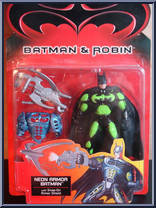 Batman and Robin respond immediately b. . .
Gotham City becomes a very cold place when Mr. Freeze, Poison Ivy and Bane triple team to plot the icy demise of Batman and Robin. The crimefighters respond immediately by using the Batcomputer deep w. . .